Feeding The Spirit is continually gratified by your support. Thanks to our committed volunteers, generous donors, and supportive community, Feeding the Spirit has grown far beyond our humble beginnings. With your help, over the past seven years, we have provided in excess of 30,000 meals to those in need in our community. Our desire and ability to uplift only continues to grow. Each spring, we come together and invite our volunteers, donors, and supporters to share in an evening of music, food, fellowship and fun. On Friday, May 10th, 2019, we will gather at Rizzo’s Malabar Inn Banquet Hall to celebrate the year’s accomplishments and look forward to the coming year, all to the soulful sounds of Darryl and Kim. This year, we are pleased to offer sponsorship opportunities for businesses and corporations. Packages vary, but each includes name recognition and tickets to the event. Join us for an evening of food, fun, fellowship and music as we celebrate the accomplishments of the past year and garner resources for the year to come! Tickets are $40 and include hearty appetizers, an infamous Pittsburgh cookie table, a basket raffles and silent auction, and music by Darryl and Kim. For tickets, sponsorship opportunities, or information on how you can help, call Michele Wengryn at 304.677.2644 or email her at FTS.michelew@gmail.com. Grant from Dominion Energy Warmed Many Hearts during a Record Cold January. A $10,000 grant from Dominion Energy could not have come at a better time for Feeding the Spirit. The grant, earmarked for for homeless placement, or for poor families at risk of becoming homeless, will directly help individuals in crisis situations. Last year 500 people were placed and taken off the streets. This grant will directly assist those efforts and help carry out the mission. ​Read the full article featured in the Tribune Review. Local resident, Dale Dix will be bicycling across America to raise money and awareness for Feeding the Spirit! Dale and a group of riders will cover 3,650 miles cross country starting in June, 2017 in Oregon and finishing in August, 2017 in New Hampshire. Feeding the Spirit would like to thank Dale for his generous contribution of his time, energy and we wish him much success! We'll keep you posted on Dale's efforts this summer during the ride. Dale Dix of Greensburg will ride across country to benefit Feeding the Spirit! Feeding the Spirit's Shelly Hoover and Deb Thackarh at Greensburg's Summersounds at St. Clair Park on July 14th. ​Feeding the Spirit partnered with both ART ON TAP and SummerSounds in July . This provided an opportunity to reach out to the local community to educate and inform about the great things Feeding the Spirit does for those in need. Learn more about how you can donate time, money or goods and services to Feeding the Spirit! 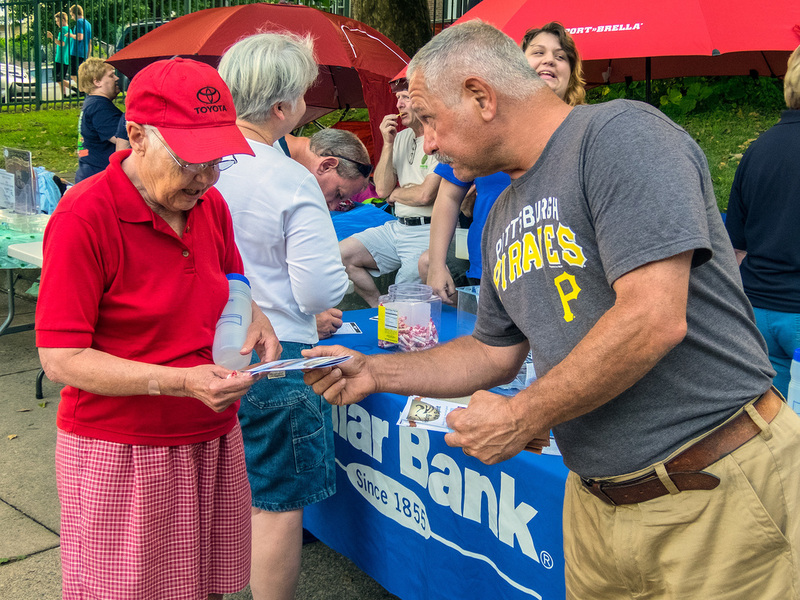 Feeding the Spirit volunteer, Carl Dipietro talks to a community member about Feeding the Spirit at Greensburg's Summersounds in St. Clair Park on July 14th.